For other uses, see Polybius (disambiguation). Polybius (/pəˈlɪbiəs/; Greek: Πολύβιος, Polýbios; c. 208 – c. 125 BC) was a Greek historian of the Hellenistic period noted for his work The Histories, which covered the period of 264–146 BC in detail. The work describes the rise of the Roman Republic to the status of dominance in the ancient Mediterranean world and includes his eyewitness account of the Sack of Carthage in 146 BC. 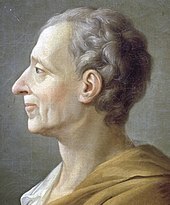 Polybius is important for his analysis of the mixed constitution or the separation of powers in government, which was influential on Montesquieu's The Spirit of the Laws and the framers of the United States Constitution. Polybius was born around 208 BC in Megalopolis, Arcadia, when it was an active member of the Achaean League. His father, Lycortas, was a prominent, land-owning politician and member of the governing class who became strategos (commanding general) of the Achaean League. Consequently, Polybius was able to observe first hand the political and military affairs of Megalopolis. He developed an interest in horse riding and hunting, diversions that later commended him to his Roman captors. In 182 BC, he was given quite an honor when he was chosen to carry the funeral urn of Philopoemen, one of the most eminent Achaean politicians of his generation. In either 169 BC or 170 BC, Polybius was elected hipparchus (cavalry officer), an event which often presaged election to the annual strategia (chief generalship). His early political career was devoted largely towards maintaining the independence of Megalopolis. Polybius’ father, Lycortas, was a prominent advocate of neutrality during the Roman war against Perseus of Macedon. Lycortas attracted the suspicion of the Romans, and Polybius subsequently was one of the 1,000 Achaean nobles who were transported to Rome as hostages in 167 BC, and was detained there for 17 years. In Rome, by virtue of his high culture, Polybius was admitted to the most distinguished houses, in particular to that of Lucius Aemilius Paullus Macedonicus, the conqueror in the Third Macedonian War, who entrusted Polybius with the education of his sons, Fabius and Scipio Aemilianus (who had been adopted by the eldest son of Scipio Africanus). Polybius remained on cordial terms with his former pupil Scipio Aemilianus and was among the members of the Scipionic Circle. When Scipio defeated the Carthaginians in the Third Punic War, Polybius remained his counsellor. The Achaean hostages were released in 150 BC, and Polybius was granted leave to return home, but the next year he went on campaign with Scipio Aemilianus to Africa, and was present at the Sack of Carthage in 146, which he later described. Following the destruction of Carthage, Polybius likely journeyed along the Atlantic coast of Africa, as well as Spain. After the destruction of Corinth in the same year, Polybius returned to Greece, making use of his Roman connections to lighten the conditions there. Polybius was charged with the difficult task of organizing the new form of government in the Greek cities, and in this office he gained great recognition. In the succeeding years, Polybius resided in Rome, completing his historical work while occasionally undertaking long journeys through the Mediterranean countries in the furtherance of his history, in particular with the aim of obtaining firsthand knowledge of historical sites. He apparently interviewed veterans to clarify details of the events he was recording and was similarly given access to archival material. Little is known of Polybius' later life; he most likely accompanied Scipio to Spain, acting as his military advisor during the Numantine War. He later wrote about this war in a lost monograph. Polybius probably returned to Greece later in his life, as evidenced by the many existent inscriptions and statues of him there. The last event mentioned in his Histories seems to be the construction of the Via Domitia in southern France in 118 BC, which suggests the writings of Pseudo-Lucian may have some grounding in fact when they state, "[Polybius] fell from his horse while riding up from the country, fell ill as a result and died at the age of eighty-two". Polybius’ Histories cover the period from 264 BC to 146 BC. Its main focus is the period from 220 BC to 167 BC, describing Rome's efforts in subduing its arch-enemy, Carthage, and thereby becoming the dominant Mediterranean force. Books I through V of The Histories are the introduction for the years during his lifetime, describing the politics in leading Mediterranean states, including ancient Greece and Egypt, and culminating in their ultimate συμπλοκή or interconnectedness. In Book VI, Polybius describes the political, military, and moral institutions that allowed the Romans to succeed. He describes the First and Second Punic Wars. Polybius concludes the Romans are the pre-eminent power because they have customs and institutions which promote a deep desire for noble acts, a love of virtue, piety towards parents and elders, and a fear of the gods (deisidaimonia). He also chronicled the conflicts between Hannibal and Publius Cornelius Scipio Africanus such as the Battle of Ticinus, the Battle of the Trebia, the Siege of Saguntum, the Battle of Lilybaeum, and the Battle of Rhone Crossing. In Book XII, Polybius discusses the worth of Timaeus’ account of the same period of history. He asserts Timaeus' point of view is inaccurate, invalid, and biased in favor of Rome. Therefore, Polybius's Histories is also useful in analyzing the different Hellenistic versions of history and of use as a credible illustration of actual events during the Hellenistic period. In the seventh volume of his Histories, Polybius defines the historian's job as the analysis of documentation, the review of relevant geographical information, and political experience. Polybius held that historians should only chronicle events whose participants the historian was able to interview, and was among the first to champion the notion of factual integrity in historical writing. In Polybius' time, the profession of a historian required political experience (which aided in differentiating between fact and fiction) and familiarity with the geography surrounding one's subject matter to supply an accurate version of events. Polybius himself exemplified these principles as he was well travelled and possessed political and military experience. He did not neglect written sources that proved essential material for his histories of the period from 264 BC to 220 BC. When addressing events after 220 BC, he examined the writings of Greek and Roman historians to acquire credible sources of information, but rarely did he name those sources. Polybius wrote several works, the majority of which are lost. His earliest work was a biography of the Greek statesman Philopoemen; this work was later used as a source by Plutarch when composing his Parallel Lives, however the original Polybian text is lost. In addition, Polybius wrote an extensive treatise entitled Tactics, which may have detailed Roman and Greek military tactics. Small parts of this work may survive in his major Histories, but the work itself is lost, as well. Another missing work was a historical monograph on the events of the Numantine War. The largest Polybian work was, of course, his Histories, of which only the first five books survive entirely intact, along with a large portion of the sixth book and fragments of the rest. Along with Cato the Elder (234–149 BC), he can be considered one of the founding fathers of Roman historiography. Livy made reference to and uses Polybius' Histories as source material in his own narrative. Polybius was among the first historians to attempt to present history as a sequence of causes and effects, based upon a careful examination and criticism of tradition. He narrated his history based upon first-hand knowledge. The Histories capture the varied elements of the story of human behavior: nationalism, xenophobia, duplicitous politics, war, brutality, loyalty, valour, intelligence, reason, and resourcefulness. Aside from the narrative of the historical events, Polybius also included three books of digressions. Book 34 was entirely devoted to questions of geography and included some trenchant criticisms of Eratosthenes, whom he accused of passing on popular preconceptions or laodogmatika. Book 12 was a disquisition on the writing of history, citing extensive passages of lost historians, such as Callisthenes and Theopompus. Most influential was Book 6, which describes Roman political, military, and moral institutions, which he considered key to Rome's success; it presented Rome as having a mixed constitution in which monarchical, aristocratic, and popular elements existed in stable equilibrium. This enabled Rome to escape, for the time being, the cycle of eternal revolutions (anacyclosis). While Polybius was not the first to advance this view, his account provides the most cogent illustration of the ideal for later political theorists. A key theme of The Histories is the good statesman as virtuous and composed. The character of the Polybian statesman is exemplified in that of Philip II. His beliefs about Philip's character led Polybius to reject historian Theopompus' description of Philip's private, drunken debauchery. For Polybius, it was inconceivable that such an able and effective statesman could have had an immoral and unrestrained private life as described by Theopompus. In recounting the Roman Republic, Polybius stated that "the Senate stands in awe of the multitude, and cannot neglect the feelings of the people". Other important themes running through The Histories are the role of Fortune in the affairs of nations, his insistence that history should be demonstratory, or apodeiktike, providing lessons for statesmen, and that historians should be "men of action" (pragmatikoi). Polybius is considered by some to be the successor of Thucydides in terms of objectivity and critical reasoning, and the forefather of scholarly, painstaking historical research in the modern scientific sense. According to this view, his work sets forth the course of history's occurrences with clearness, penetration, sound judgment, and, among the circumstances affecting the outcomes, he lays special emphasis on geographical conditions. Modern historians are especially impressed with the manner in which Polybius used his sources, particularly documentary evidence as well as his citation and quotation of sources. Furthermore, there is some admiration of Polybius's meditation on the nature of historiography in Book 12. His work belongs, therefore, amongst the greatest productions of ancient historical writing. The writer of the Oxford Companion to Classical Literature (1937) praises him for his "earnest devotion to truth" and his systematic pursuit of causation. It has long been acknowledged that Polybius's writings are prone to a certain hagiographic tone when writing of his friends, such as Scipio, and subject to a vindictive tone when detailing the exploits of his enemies, such as Callicrates, the Achaean statesman responsible for his Roman exile. As a hostage in Rome, then as client to the Scipios, and after 146 BC, a collaborator with Roman rule, Polybius was probably in no position to freely express any negative opinions of Rome. Peter Green advises that Polybius was chronicling Roman history for a Greek audience, to justify what he believed to be the inevitability of Roman rule. Nonetheless, Green considers Polybius's Histories the best source for the era they cover. For Ronald Mellor, Polybius was a loyal partisan of Scipio, intent on vilifying his patron's opponents. Adrian Goldsworthy, while using Polybius as a source for Scipio's generalship, notes Polybius' underlying and overt bias in Scipio's favour. H. Ormerod considers that Polybius cannot be regarded as an 'altogether unprejudiced witness' in relation to his betes noires; the Aetolians, the Carthaginians, and the Cretans. Other historians perceive considerable negative bias in Polybius' account of Crete; on the other hand, Hansen notes that the same work, along with passages from Strabo and Scylax, proved a reliable guide in the eventual rediscovery of the lost city of Kydonia. Polybius was responsible for a useful tool in telegraphy that allowed letters to be easily signaled using a numerical system (mentioned in Hist. X.45.6 ff.). This idea also lends itself to cryptographic manipulation and steganography. This was known as the "Polybius square", where the letters of the alphabet were arranged left to right, top to bottom in a 5 x 5 square, (when used with the modern 26 letter alphabet, the letters "I" and "J" are combined). Five numbers were then aligned on the outside top of the square, and five numbers on the left side of the square vertically. Usually these numbers were arranged 1 through 5. By cross-referencing the two numbers along the grid of the square, a letter could be deduced. In The Histories, he specifies how this cypher could be used in fire signals, where long-range messages could be sent by means of torches raised and lowered to signify the column and row of each letter. This was a great leap forward from previous fire signaling, which could send prearranged codes only (such as, 'if we light the fire, it means that the enemy has arrived'). Other writings of scientific interest include detailed discussions of the machines Archimedes created for the defense of Syracuse against the Romans, where he praises the 'old man' and his engineering in the highest terms, and an analysis of the usefulness of astronomy to generals (both in the Histories). Polybius was considered a poor stylist by Dionysius of Halicarnassus, writing of Polybius' history that "no one has the endurance to reach [its] end". Nevertheless, clearly he was widely read by Romans and Greeks alike. He is quoted extensively by Strabo writing in the 1st century BC and Athenaeus in the 3rd century AD. His emphasis on explaining causes of events, rather than just recounting events, influenced the historian Sempronius Asellio. Polybius is mentioned by Cicero and mined for information by Diodorus, Livy, Plutarch and Arrian. Much of the text that survives today from the later books of The Histories was preserved in Byzantine anthologies. His works reappeared in the West first in Renaissance Florence. Polybius gained a following in Italy, and although poor Latin translations hampered proper scholarship on his works, they contributed to the city's historical and political discourse. Niccolò Machiavelli in his Discourses on Livy evinces familiarity with Polybius. Vernacular translations in French, German, Italian and English first appeared during the 16th century. Consequently, in the late 16th century, Polybius's works found a greater reading audience among the learned public. Study of the correspondence of such men as Isaac Casaubon, Jacques Auguste de Thou, William Camden, and Paolo Sarpi reveals a growing interest in Polybius' works and thought during the period. Despite the existence of both printed editions in the vernacular and increased scholarly interest, however, Polybius remained an "historian's historian", not much read by the public at large. Printings of his work in the vernacular remained few in number — seven in French, five in English, and five in Italian. Polybius' political analysis has influenced republican thinkers from Cicero to Charles de Montesquieu to the Founding Fathers of the United States. John Adams, for example, considered him one of the most important teachers of constitutional theory. Since the Age of Enlightenment, Polybius has in general held appeal to those interested in Hellenistic Greece and early Republican Rome, while his political and military writings have lost influence in academia. More recently, thorough work on the Greek text of Polybius, and his historical technique, has increased the academic understanding and appreciation of him as a historian. According to Edward Tufte, he was also a major source for Charles Joseph Minard's figurative map of Hannibal's overland journey into Italy during the Second Punic War. In his Meditations On Hunting, Spanish philosopher José Ortega y Gasset calls Polybius "one of the few great minds that the turbid human species has managed to produce", and says the damage to the Histories is "without question one of the gravest losses that we have suffered in our Greco-Roman heritage". The Italian version of his name, Polibio, was used as a male first name - for example, the composer Polibio Fumagalli - though it never became very common. The University of Pennsylvania has an intellectual society, the Polybian Society, which is named in his honor and serves as a non-partisan forum for discussing societal issues and policy. This page is based on the Wikipedia article Polybius; it is used under the Creative Commons Attribution-ShareAlike 3.0 Unported License (CC-BY-SA). You may redistribute it, verbatim or modified, providing that you comply with the terms of the CC-BY-SA.